Three people are dead after a serious semi-truck accident. An SUV drove into a parked semi-trailer truck early Wednesday morning in Lynnwood, a crash that has also sent a fourth person, a 15-year-old girl, to the hospital with serious injuries. The Snohomish County Sheriff’s Office said the SUV slammed into the back of the semi-trailer truck, which was parked in a designated parking area. Images from the crash show the vehicle wedged under the trailer. The crash occurred on a stretch of the Alderwood Mall Parkway where drivers regularly park their trucks and either leave them unattended or sleep in them. There are no witnesses to the incident, according to police. The cause of the crash is not yet known. The semi-trailer involved was not attached to a semi-truck at the time, but according to a police spokesperson, was not parked in the right direction. The front of the trailer faced oncoming traffic, making it a safety hazard to drivers. The violation is a civil parking violation. The only way a parked semi-truck can be found liable for an accident is if the truck was negligently parked. If the truck is pulled over onto the shoulder of a highway and the trailer is sticking into traffic, the truck driver would likely be held at least partially responsible if a car crashed into it. Despite the tragic nature of these crashes, it is important that those involved in a crash understand their legal rights. Trucking companies will send a team of investigators to the scene of the crash to interview witnesses and injured victims. 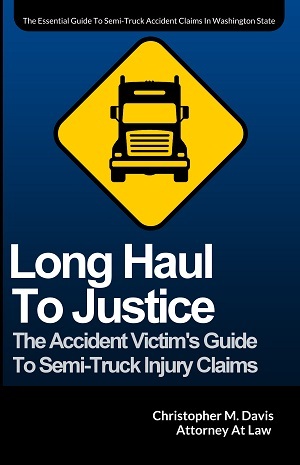 Those who consult with an attorney after a crash are much less likely to be taken advantage of by a trucking company and its defense lawyers. Many studies have been done in the past five years exploring the shortage of commercial truck parking in the United States. Those reports, conducted by public, private, academic and non-profit entities, show an inadequate supply of parking that can result in two negative consequences: first, tired drivers may continue to drive because they have difficulty finding a safe place to park and rest, and second, drivers may have to park in unsafe locations, such as the shoulder of a highway. An August 2015 Department of Transportation survey found that the state of Washington has 3,596 total truck parking spaces, 920 of which are public. Washington has 96 public facilities with truck parking, the second most in the country (Ohio, 98). A 2012 law provided more than $6 million in federal funding toward the construction of safe roadside parking lots for truckers, but the problem still exists. However uncomfortable, anyone injured in a car accident caused by a friend or family member should file a claim to cover injuries, expenses, as well as pain and suffering. It is important to understand that these claims are not personal attacks on a friend or family member, it is simply the way the system works. A passenger in a car crash can file a claim or lawsuit against a loved one that was responsible for the wreck. Any damages received comes from the insurance company, not the defendant, and is the only way to receive proper compensation.